Three space news stories about getting humans off Earth. 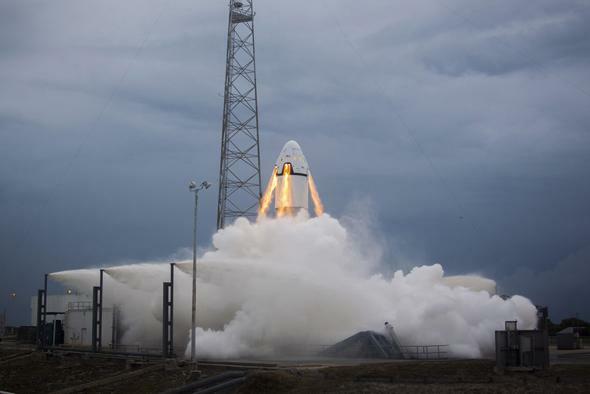 The pad abort test for the SpaceX Dragon capsule from May 2015; one of many steps necessary to ensure a safe return to space for American astronauts. I don’t normally combine multiple topics into a single post, but there’ve been some interesting space news items this week that I haven’t had a chance to write about. So here they are, briefly. Think of it as a threefer. This is disappointing, but not entirely surprising. SpaceX and Boeing were the two contractors chosen by NASA to return American crews to space on American rockets. Boeing already had a launch date slip, and now SpaceX will have to do deal with one as well. The reason traces back to the explosion of a Falcon 9 rocket during fueling in preparation for a launch in September. While SpaceX is confident the problem was in the prep and not the rocket itself, the investigation is ongoing. Their current plan for launching a crew is to load fuel on the rocket while the astronauts are already in the Dragon capsule on the rocket; obviously this needs some further thought. You can read the details at AmericaSpace. Unfortunately, this means another year of NASA being gouged by the Russians for seats on their Soyuz rockets. I’ve never been happy about that, but given the revelations about Putin’s interference with our elections, this makes this an even more bitter pill to swallow. 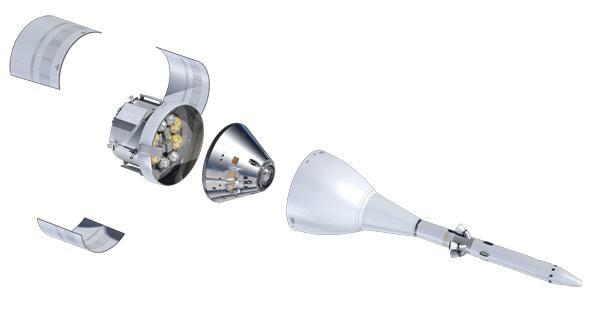 An exploded view of the top of the SLS rocket showing (R to L) the abort tower, the Orion capsule, and the service module. While I’m a big fan of the Boeing and SpaceX crewed mission rockets, I’m not nearly as enthusiastic for NASA’s own Space Launch System and Orion capsule. They are too expensive to design, build, and launch, may only fly once ever two years, and may not leave enough NASA budget left over for other missions. Still, the plans for them go forward, and another milestone was reached this week when the European Space Agency handed over ownership of the test Orion service module to NASA. This is a test version of the actual service module, a five-meter-wide and four-meter-high cylindrical assembly that attaches to the bottom of the capsule and provides propulsion, power, and thermal control as well as water and air for the astronauts in Orion. This is a similar piece of equipment that sat behind the Apollo Command Module used in the lunar missions. The test module has been undergoing tests for some time, but now will be tested together with the Orion capsule. Right now the plan is to have the first SLS/Orion test flight in 2018. Astronauts on the ISS grapple the Kounotori resupply ship. 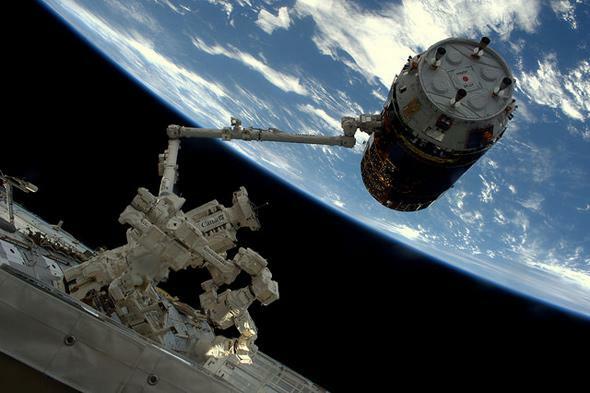 On Wednesday, astronauts on the International Space Station captured and berthed a Japanese robotic supply craft called Kounotori (“white stork”). The spacecraft (technically called the H-II Transfer Vehicle) is loaded with four tons of supplies, including food, equipment, and batteries to store electricity generated by the station’s solar power arrays. This is excellent news, especially given a Russian resupply vehicle failed to reach orbit after launch on Dec. 1. The next scheduled supply launch to the ISS is a SpaceX Falcon 9 Dragon 9 mission, called CRS-10 (for Cargo Resupply Services-10), which is set for Jan. 22, 2017.